Babasaheb Ahmed Sahab Sanadi, writer, translator, thinker and orator, died at Kumta in Uttara Kannada district on Saturday night. He was 86. He leaves behind his wife and two children. He hailed from Shindolli in Belagavi district. The final rites were performed at Shindolli on Sunday evening. He was a winner of the coveted Pampa award and the Rajyotsava award. He was among those writers who worked as an organic link between the literary worlds of Kannada, Marathi, and Urdu. 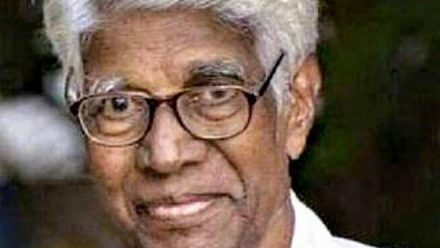 A postgraduate in Kannada and Sanskrit, Sanadi worked as an officer with the All India Radio, Mumbai, for several decades, before settling down in Kumta in Uttara Kannada district. He wrote books in Kannada, translated books from Marathi and Urdu to Kannada. He was awarded a honoris causa by the Karnatak University, Dharwad. He won several awards including the Karnataka Sahitya Academy award. At a condolence meeting at the sahitya parishat on Sunday, writers hailed Sanadi as a writer who had crossed over the limitations of language and religion. “He is among the few writers who tried to build bridges between different linguistic and religious groups,” said Sarjoo Katkar, writer. Chandrakanth Pokale hailed his contribution to the field of translation. Shivaraya Elukoti recalled his ability to come up with poems on contemporary issues in quick succession. Ramakrishna Marathe said the Sanadi Trust will carry on literary programmes in Belagavi.